Robin Hood and his band of Merry Men are one of the more enduring stories from British history and popular legend would have it that these green-clad heroes lived in Sherwood Forest, robbing the rich and giving to the poor in an act of self-less wealth redistribution. Action packed tales make a great basis for online slots and here we present five of our favourites using this theme; they are from five different developers, all taking a somewhat different approach to this famous character. 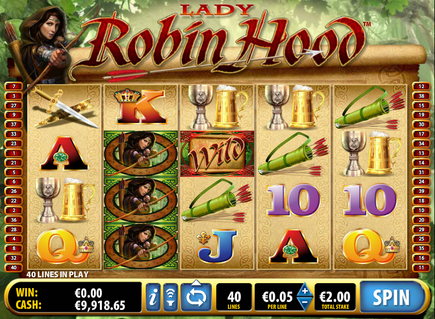 Lady Robin Hood is a Bally Technologies release with a female version of the legend, robbing from the rich and giving to the poor. It features two separate bonus features. Click here for the full review. 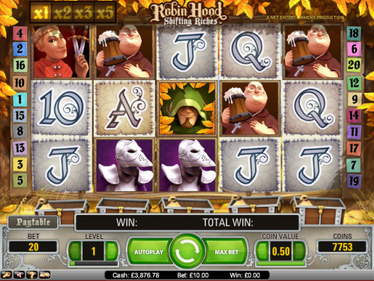 Robin Hood Shifting Riches is Net Entertainment's tribute to Robin Of Loxley and a very good one it is too. Extremely high quality graphics and the famous 'Shifting Reels' make this one not too miss. Click here for the full review. 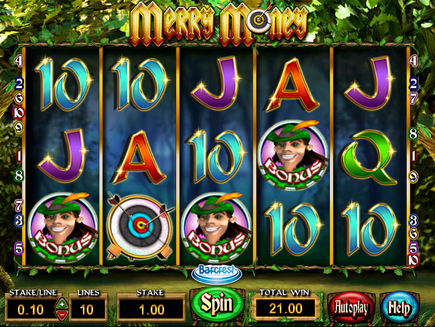 Merry Money features a Robin Hood character with one of the cheesiest grins we've seen in an online slot; this Barcrest game is colourful and there are three separate features to sink your teeth into. Click here for the full review. Robyn is not actually based on Robin Hood but the similarities and influences are fairly obvious. We love the crips graphics from Genesis Gaming and there's a free spins round to enjoy. Click here for the full review. 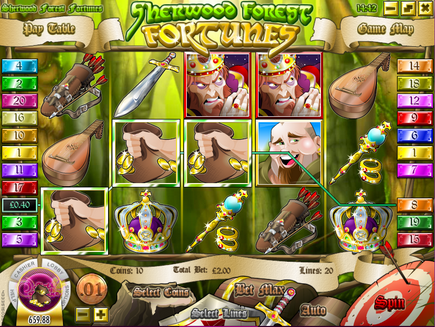 Sherwood Forest Fortunes is from Rival Gaming and part of it's appeal is it's cartoonish design but it also has two bonus features to enjoy. 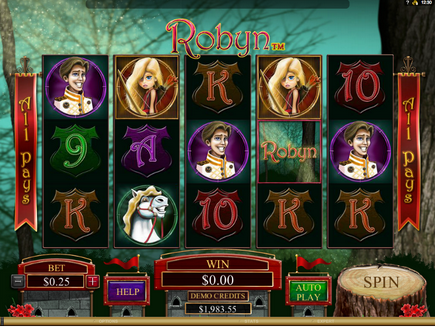 It's part of the i-Slots range which in this case means there a narrative running through the whole game. Click here for the full review.